Endless paper forms, inflexible apps, chaotic Excel sheets that don’t allow picture uploads… Inefficient solutions cost your retail management team valuable time and leave room for costly mistakes. Not to mention a lack of insight into your retail business, as you wait for data to be analyzed and reports to be generated. Our store checker app provides a user-friendly interface, instant reporting, and a standardized workflow to improve productivity and eliminate errors. Field reps and store managers are responsible for the in-store execution and sales performance. But simply checking the boxes on a list of questions isn’t going to build the perfect shopping experience. Live reports that can visualize the current results and compare them to benchmarks will deliver real-time insights. Improvements can be made on the spot! Successful retail execution is more about coaching than monitoring. While numbers will provide insights, it’s actionable suggestions that will stimulate store managers to keep on improving. 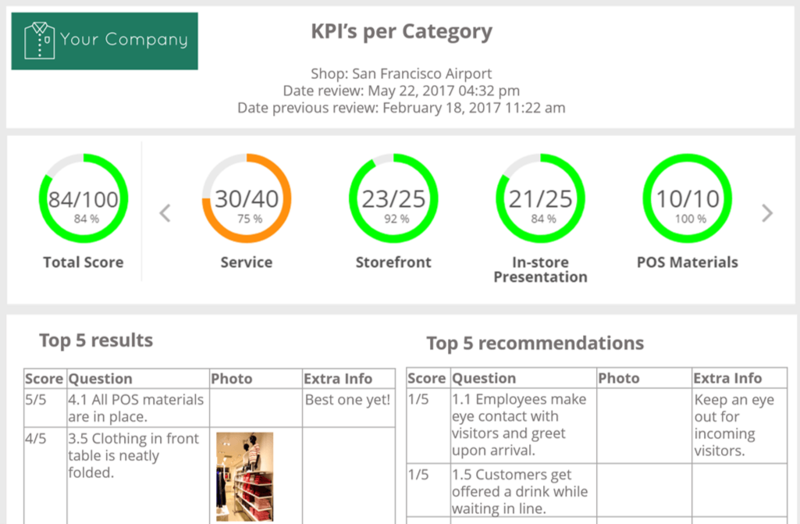 A tool that shares audit results immediately, allows a store manager to self-assess and discover their highest and lowest scores. Or let a field representative discuss those scores with the store manager. Clear action points on the spot! By allowing users to filter on their personal profile or region, and by providing access to only those things that are important will help your team to remain focused, improving quality and performance. And while teams get a narrowed down focus, the collected data is available for more elaborate analysis and general insights needed by those in charge of operations. One place to sign in, make changes, view results and create reports. An extremely lightweight tool that is easy to implement, yet built for high performance and scalability. Manage everything in the cloud. No infrastructure that needs to be maintained by entire IT teams or expensive softwares that take weeks to set up. Live reports are generated as soon as a checklist is completed. Easily compare current results to company benchmarks or the results of a previous audit. Flawlessly integrate with numerous Business Intelligence platforms for more advanced reporting and analysis. Manage checklists on the spot. Add or update questions at any given time. Access and check store results in real time and create reports when needed. Build an entire audit process by yourself in an easy-to-use editor. No setup costs if you don’t want them. Use scoring features and business rules: Simple and straightforward or with complex weighting factors. Move swiftly from one question to the next, without distractions: Just a single question per screen and the ability to swipe through questions. Divide your checklist into multiple categories. User authentication allows each field representative to use a personal login to access their list of stores, reports and results. Easily upload pictures taken in the store to illustrate specific answers on a checklist. Sign off store checks with a personal signature.